Start with a review of 2013. How did you fare? What did you miss? Which tasks are pending? Where did you make mistakes? Were your investments on track? This will help you know the steps you need to take to improve your finances. Budgeting is a basic, but important, tool. Knowing what you earned and where your money went makes you aware about your financial situation. Most of the times, when your expenses are high, a large part is accounted for by things such as entertainment and eating out, which are difficult to track. Keeping a check on expenses has two benefits. First, you can know the excess outgo, and, second, you can analyse the spending habits of your family members. By creating a budget, you can limit each expense so that you do not live beyond your means. Also, if the budget is going out of control, this will help you know where to take corrective action. One good way of following the budget is dividing the monitoring of fixed andvariable expenses between you and your spouse. If you missed out on thislast year, begin 2014 by creating a budget for the year so that you can con-trol your spending. This thumb rule relates to understanding a simple equation:Income-Savings=Expenses. This means that whatever you income,you must first set aside money for savings and then start routineand discretionary purchases. This will ensure that you do not skipcontributions for essential life goals such as retirement. This can beachieved through systematic investment planning and auto transferto your child's account. If you are salaried, you can also open a sep-arate bank account for savings and set up monthly auto transferfrom your salary account to this account. This will ensure consis-tent savings for building a nest egg. Your finances are worst-hit when you fall ill or lose your job. If you do not havefunds for such emergencies, you may have to tap into savings you may havekept for your life goals. For a salaried person, this may mean starting savingfrom the scratch. Also, most of us have loans to pay, and any emergency canlead to default. This can jeopardise the credit history as well. Hence, it's nec-essary to have an emergency fund. 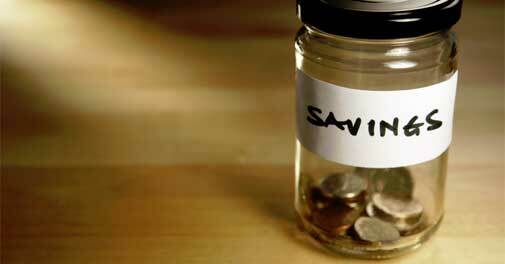 Ideally, you should be able to meet about four-six months' expenses in case of an emergency. If you have been fallingshort on this account, calculate how much your ideal emergency fund shouldhave and start saving from this month to reach the required level. It's not surprising that most of us go into heavy debt as we reach themiddle of our career. Easy availability of finance brings with it a tempta-tion to enhance our lifestyle with every rise in the paycheck. But manytimes we go overboard when we start piling debt in anticipation that therise in future income will help us repay the loans. The dependency is somuch that almost 50% of our earnings go into paying our liabilities. Thislowers contribution for life goals. Avoid such temptations and do notoverburden yourself with debt. Housing loan is a good debt, as it helpsyou create an asset, while credit card debt may land you in troublebecause of the high interest cost. Ideally, if you raise debt, keep the EMIswithin 25-30% of your net income so that you can manage your cash flowcomfortably. If your debt was high last year, make a strategy to lower it. Life is full of uncertainties. Not having adequate protection for your familycan create a lot of difficulties. It is important to identify the amount of pro-tection required for your family and buy it through the right means. Analysewhat insurance covers you need to protect your family. Buy the right instru-ments. Don't make the mistake of combining insurance with investment.Some basic covers are health, disability and home. It may happen that the premium outgo in some situations may not justifythe coverage or you may not find the right instruments. In such a case,build a corpus for the specific event. At times combining insurance with thiscorpus can provide good protection. All of us have goals, be it riding high in career, buying a house/car or providing good education to children. Each of these is important. But many times we set goals on the basis of peer pressure or high aspirations. These do not reflect our financials and, as a result, some of the important goals become unachievable, creating a huge disappointment for us. So, it's important to ensure that you set goals that are measurable in monetary terms and achievable within your resources. Most of us set vague goals such as retiring early or going on a foreign trip every year after retirement. But we forget that our financial situation keeps changing and we do not know how things will turn out in the future. If we are not aware of our future requirements, there will always be a higher probability of falling short of meeting our goals. So, analyse your requirements and convert them into monetary terms. This will help you identify the resources needed. You can then fill the gaps. Whether it is equities, debt, real estate or gold, investing is the keyto a stable future. But most of the time we forget this by linkinginvestments with returns. This leads to mistakes such as overin-vesting in a single asset or taking risk beyond our capacity. Ensurethat you invest for your goals and follow an asset allocation strate-gy which is within your risk tolerance zone. If you are advised toallocate more for an investment that is above your risk tolerancelevel, understand its risk-return characteristics before goingahead. Most of your financial decisions are a result of your behaviour.This may be difficult to monitor, but how you buy householditems and one-off things such as car decides how your financeswill shape up. You may shop at upscale markets but there aresupermarkets which offer good discounts on the same items.Generally, at the end of season, retailers offer huge discountsto offload inventory. Going for off-brand or store brands maysave you an additional 10-20%. If you are a frequent shopper,switching to need-based and end-of-season sale shopping fornext year will help you save a lot of money. Similarly, buying acar may be a lifestyle decision, but keeping in mind factorssuch as fuel efficiency and cost of maintenance, etc, may helpyou save routine expenses. If you are a lifestyle shopper, achange in behaviour may bring huge savings for your family. There is no dearth of information today. For every financialdecision that you have to make, you can take help from analy-sis on a number of websites, newspapers, blogs and onlineforums. Make yourself financially literate and research well.Read about the topic on which you are going to take a decisionin detail and, if required, take advice from an expert. This is essential for ensuring that your family does nothave to search for information about your assets in anemergency. This can also avoid inheritance disputes.Maintain a proper record of your finances and make afamily member such as your spouse aware of it. You canuse online tools or desktop tools such as Excel. This willhelp your family locate information easily when it needs it. Passing your legacy to your children is important. Butmany family members go for litigation over inheritance.These cases can go on for years. Till then your family willbe deprived of the assets you have built for them. To avoidsuch situations, write a will specifying your wish. A well-written will can resolve many disputes and keep love andaffection among your family members intact. Health is wealth. If you are not healthy, it affects yourcareer, your family environment and your finances. Work-life balance is most important now considering the amountof stress you have to experience in your career. If you havenot been good at it, exercise regularly and eat healthy sothat the chances of illnesses reduce. There are other aspects of personal finance such as making your spouse a partner in your decisions, working on right nominations, etc, which are equally important. But the above 14 discussed are the basic starting points for financial planning. By following them you can ensure that you are prepared for the future. A new year is always a good reason to start.